Richmond Park is a very large park in London. Richmond Park is enclosed by a high wall, but there are several roads that run through the park. Inside the park are a number of gardens. Visitors to the park can see some spectacular views (especially from King Henry VIII's mound which offers a view of St. Paul's Cathedral). Richmond Park is something of a refuge for wildlife. Wildlife in the park includes red and fallow deer, and a population of parakeets which are believed to have bred from birds that escaped from captivity. Stunning photographs of London's Richmond Park. When your family home has been demolished by a ruling power terrified of mutiny and the love of your life gives their heart to another, wouldn't you search the open city for a better future? This is a story of one Londoner who found himself in this situation. He just happens to have fur and four legs. With the help of an adventure-seeking magpie, Vince the fox is determined to find his grandparents’ old home, which exists somewhere within England's capital. The threat of political exile and the city's modern, mechanical and multicultural challenges will not stop him. 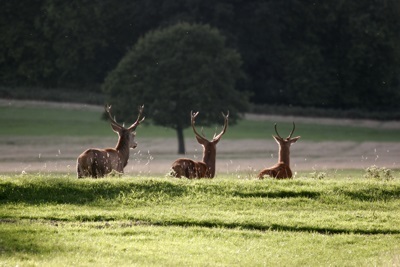 But back in Richmond Park, Edward the alpha-stag is paranoid: if Vince's departure encourages a multi-species uprising, the deer will lose their power – and Edward is hardly the only tyrannical ruler to be feared in the capital's parks. Just what has Vince started beneath the eyeline of London's human population? Richmond Park is the largest Royal Park in London, covering an area of 2,500 acres. From its heights there is an uninterrupted view of St Paul’s Cathedral, 12 miles away.The royal connections to this park probably go back further than any of the others, beginning with Edward I in the thirteenth century, when the area was known as the Manor of Sheen. The name was changed to Richmond during Henry VII’s reign. In 1625 Charles I brought his court to Richmond Palace to escape the plague in London and turned it into a park for red and fallow deer. His decision, in 1637, to enclose the land was not popular with the local residents, but he did allow pedestrians the right of way. To this day the walls remain. In 1847 Pembroke Lodge became the home of the then Prime Minister, Lord John Russell, and was later the childhood home of his grandson, Bertrand Russell.However, Richmond Park emerges from its historical record as a place that has seen many changes in fabric and detail and yet remains the embodiment of a medieval deer park. It is a palimpsest, retaining subtle clues to each period in its history.